The earliest I could find this quote by Tim O’Reilly was in 2011, however I would wager that this was muttered years before that and has since been said at least once by every VC, startup founder, and even on HBO’s Silicon Valley. The only problem is, in many cases being too early no longer means you’re wrong, it means you have a chance to be right. Today, tech companies can disrupt incumbents faster and cheaper than ever before. In the past, being too early was entirely possible. Pretty much everybody during the dot-com bubble was “too early” as they drastically overestimated (or got overexcited) about the user base of the internet in the late 1990’s and early 2000’s and thus economies of scale were never reached. As the internet was born the first batch of incumbents built “the infrastructure, connections and awareness that ushered in a connected world.” Then the AOLs and Netscapes of the world whiffed on what the internet would look like as it proliferated throughout the consumer market and went from dial-up to broadband. This allowed smaller, forward-thinking, and faster-moving new market entrants to unseat these slow-moving tech companies of yesterday. Because of the glacial pace of innovation at large companies and fundamental technology shifts that were happening in the mid-late 2000s, entrepreneurs were able to see developed markets that were highly inefficient and then jump into these sectors and wreak havoc. From communities to commerce, a lot of value was created in a short amount of time. We saw this again with the rise of mobile, and we’re seeing this continue today in fintech, insurance tech, digital health, and other areas that have been held back by both regulations and industry norms that have been more change-averse than most. Today, upstart companies can disrupt incumbents faster than ever before. 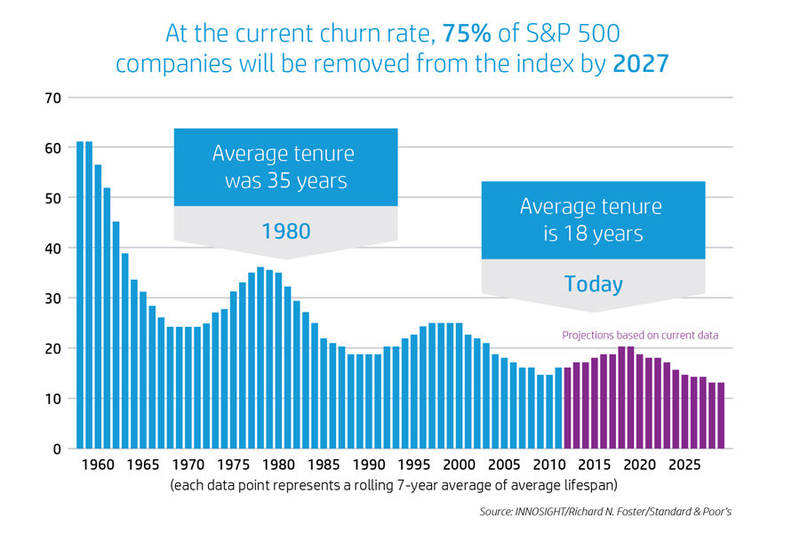 Public companies are being displaced faster than ever in the S&P 500. But the top tech companies are more disruptive than ever before. History teaches us valuable lessons, and today’s non-tech incumbents finally understand that small teams of technologists can very quickly destroy their businesses. That’s why we’re seeing a rise in Corporate VC and “innovation”from companies that never would have called themselves “tech” companies before. Even scarier to the rest of the non-traditional tech world, today’s tech titans (Google, Facebook, Amazon, Samsung, Qualcomm, Intel, Nvidia, etc.) are more innovative and faster-moving than ever before. These companies have gotten so good at “disrupting themselves” that they are willing use their massive cash positions and R&D budgets to enter new industries and inject tech or create new categories and brute force “too early” into “now”. Every week a new multi-billion dollar tech company announces the millions/billions of dollars they are investing in Autonomous Vehicles, VR/AR, AI/ML, Robotics, insert deep technological innovation here. It leads to the market wondering if companies like Apple, which is famously avoiding any sort of VR release (despite having a VR team in the hundreds) could already be too late to VR. This is ironic as concurrently, most VCs are worrying about being “too early” or “unsure” about VR. And while Apple is in a unique position due to their foothold in mobile, other public companies are paying for it. GoPro, which didn’t want to be too early to consumer drones, has clearly been steamrolled by a “startup” that was WAY too early on consumer drones called DJI, and has now lost over 40% of its value this year because the next camera revolution passed it by. So what’s a startup building the future to do? You have to be too early. In VR, Oculus was too early for pretty much everyone, except Facebook. In AI, DeepMind was promising a combination of neuroscience and machine learning and even Carnegie Mellon ML professor Larry Wasserman said “it sounded crazy”. DeepMind became arguably the backbone of Google’s future and “deep learning” has proliferated into every tech company’s future marketing. In AVs, almost ever VC in the valley passed on Cruise because it was too early and didn’t have a scalable and clear go to market. But one of the world’s largest OEMs saw the impending shitstorm that AVs was going to create and may have single-handedly created the hottest sector in all of tech right now with a $1B acquisition. In space, SpaceX and Planet Labs were too early for the public-sector dominated space industry, and now commercial space is positioned to become one of the largest sectors in the next 10 years. There are (and will be) many more examples of where “too early” is merely muttered as a safety blanket for VCs and corporates to push off developing conviction about the future, and that will spell missed opportunity. Because in today’s world, the line of “perfectly timed” and “too late” no longer exists. If you’re not too early, you’re too late.